Why are you still paying to service your air-conditioner ? We all know that when it comes to cost of living, it's generally a one-way street -- one that only goes up. So maximising the ringgit is just good money sense, and one of the best ways to do so boils down to doing some simple cleaning chores yourself instead of hiring a contractor to do it. Even if it involves a machine seemingly as complicated as the air-conditioner. We reckon most households in Malaysia have one, and that’s not a cheap item, we're sure every air-conditioner owner hopes it could lasts for many good years once the item is purchased. To keep it in a good condition, cleaning and servicing the air conditioner is definitely at the top of the list of what you should do. 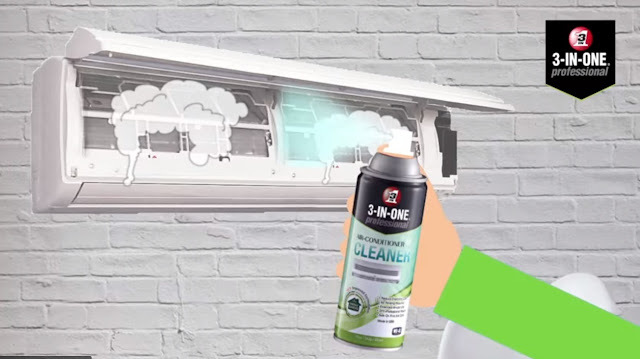 Contrary to what some may think, cleaning an air-conditioner is really as easy as 1-2-3 with a product of WD-40. To start with, just get hold of a recommended good cleaning agent - the 3-IN-ONE® Professional Air Conditioner Cleaner. 1. Safety first, so switch off the power to your air-conditioner. 2. Remove the filters and wash away the dust on them. 3. 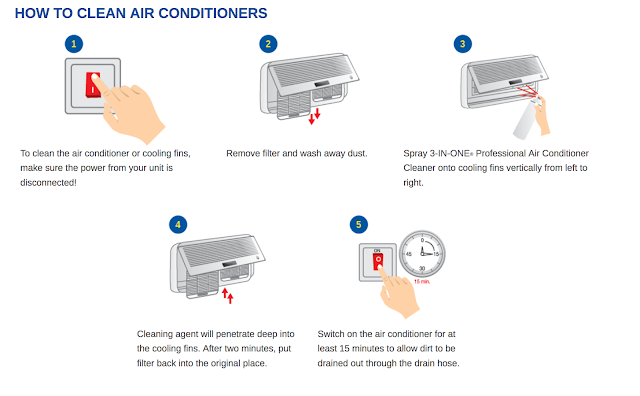 Spray the 3-IN-ONE® Professional Air Conditioner Cleaner onto the cooling fins vertically, from left to right, to ensure you cover each fin properly. 4. Leave the fins for two minutes for the cooling agent to work and then slide the filters back into place. 5. Now switch on the air conditioner for at least 15 minutes to allow the dirt to be drained out through the drain hose. That's it ! Your cleaning is done ! Upon completion of the cleaning, your air conditioner will cool faster, thus saving electricity. The best part is you will get to enjoy cleaner and fresher air ! So save that few hundred ringgit hiring someone to clean your air conditioners and just DIY today ! It's all about being a smart consumer. 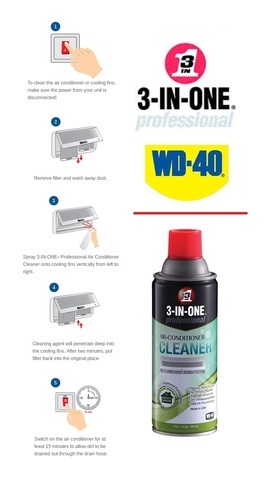 To get more tips and ideas on what you can do to improve and upkeep your home with the right products, check out http://wd40.asia on WD-40® as well as its 3-IN-ONE® product range. The 3-IN-ONE® brand has been famous since 1894, solving problems and making people smile. And that is why WD-40 Company officially acquired the 3-IN-ONE Oil business in 1995 and has been innovating ever since to produce the best product with the best delivery systems around.